Ordinary bearings are improper to use in high temperature conditions, from –150 to +350°C. Also, they are sensible to sudden changes of the temperature. There were invented high temperature bearings. They can be used in baking trolleys, rotating oven supports, in bakery equipment and freezers. 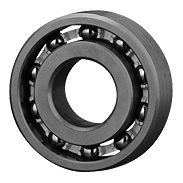 NSK SPACEA™ series ball bearings are optimal for applications in operating environments that are too severe for standard bearings. The SPACEA™ series have a wide array of product variation applicable to special environments such as vacuum, clean, corrosive, high-temperature, dust or water contaminated, and non-magnetic requirements. In demanding operating environments, these bearings will meet your high quality and high performance standards. The SPACEA™ range utilises advanced materials, lubricants and surface treatment technologies for special operating conditions.Deep groove ball bearings are the current focus of the rolling element SPACEA™ series.